Our board members are up for the challenge! Two of our Board members: Prof Jim Meaney and Fintan Cooney are taking part in the Paris2Nice cycle event, this week, to raise funds for Cancer Care and Research. Both Jim and Fintan set off from Paris on Saturday and over the course of next 6 days will have cycled just over 700km. The cycle ends on Thursday 21st September in Nice. 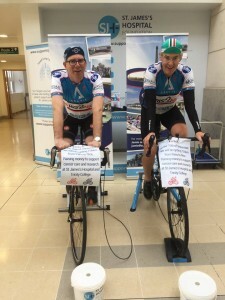 As part of their preparations they have cycled, on the hospital concourse, over the last week weeks. As well as taking part in other fundraising events.